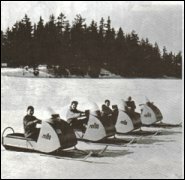 The all-new line of snowmobiles for model year 1962 was introduced quietly. There was no trade show, there were no snowmobile magazines. There wasn't much room to talk about or show a new snowmobile in a one-inch advertisement in Outdoor Life. The new Bombardier looked very much like the 1961 Bombardier. The new Polaris Sno-Travelers looked like the ones before. The newest entry on the market, the Polar snowmobile, didn't change the shape of things, either. It was still an industry operating under the "show and tell" sales principle: load a machine on a truck, drive around the countryside and try to sell it. Fred V, Gates, in Rhinelander, had his dealership well-established but customers were still few. He dreamed up plans for a second snowmobile race, bigger and better than the one on Boom Lake in 1961. He planned to mark out a nice course to the island, maybe route the sleds over and around the golf course. He took his grandiose scheme to fellow businessmen in Rhinelander. Eyebrows were raised slightly every time Fred talked about snowmobiles and races. Was he getting just a little bit crazier every year? Fred's idea for another race died for lack of a second.